LAMP seamlessly integrates with your existing systems to unlock the efficiency potential buried in the details of your data. As organizations look to streamline and structure their workflows, they will need to put more emphasis on collaboration, not only between team members, partners, and employees but also between technology systems. LAMP uses sophisticated APIs to integrate with your other IT systems and fill in the process and data gaps between them, helping increase efficiency and improve ROI. 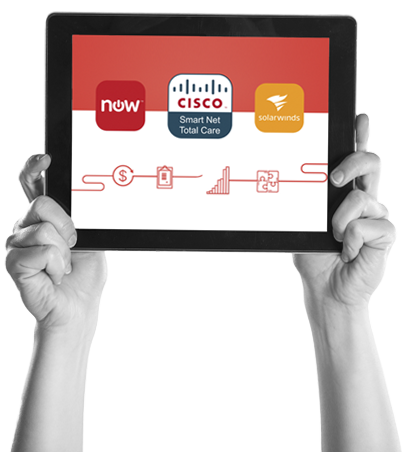 Integrations include Cisco Smart Net Total Care, ServiceNow, SolarWinds, and more. There are several benefits to integrating your systems with LAMP, and solutions can be customized to fit each organization’s unique needs. Automated synchronization and updates of asset data, ensuring accurate tracking, continual monitoring, and validation of the customer’s assets and service contracts. Low-impact integration approach simplifies processes while providing valuable information to users that is typically no more than one click away when they need it. Improved data integrity using APIs for real-time updates around asset information that includes contract details, product details, end of support dates, warranty dates, custom fields, and more. LAMP integration includes pre-defined widgets for the items most necessary to your organization, such as serial number lookup, end of contract, end of support, and more. Every step of the data exchange between LAMP and your systems enables custom filtration and configuration of asset and maintenance contract information transferred between them. Year-round tracking of asset changes in your systems through the integration process with LAMP allows for a greatly simplified contract renewal process. Contact us to find out more about LAMP and your integration options.